The new 2018 livery for Chris Atkinson’s #55 Subaru WRX STI is here. It’s not his Global Rallycross STI, it’s his new WRX STI Rally car he’ll be driving in the American Rally Association (ARA) Series in 2018. 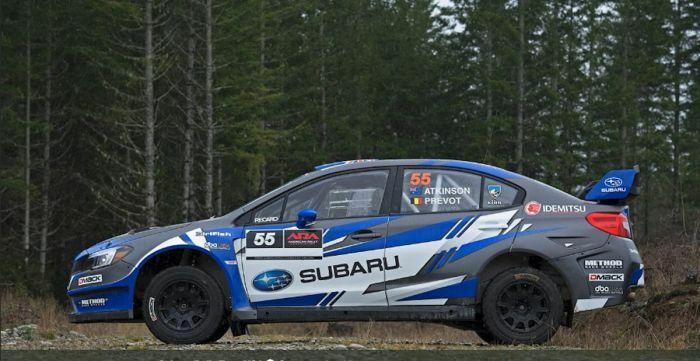 Subaru will be debuting the new rally cars at the Oregon Trail Rally (April 20-22) this weekend. Back in February, Subaru Motorsports announced Chris Atkinson and Patrik Sandell would join David Higgins and co-driver Craig Drew at select rounds of the ARA series this season. It looks like Atkinson will be piloting the #55 Subaru WRX STI Rally car this weekend in Oregon at the Oregon Trail Rally. It was a close battle last season with Subaru Rally Team USA teammates David Higgins and Travis Pastrana trading 1st and 2nd place finishes throughout the 2017 Championship run, resulting in a thin margin between the two in the ARA Driver’s Championship points leading into the final round. In the end, it was Travis Pastrana and Robbie Durant in the #199 Subaru WRX STI narrowly beating SRTUSA #75 piloted by David Higgins and co-driver Craig Drew for the 2017 American Rally Association Championship Title. They will do battle again in 2018. Atkinson and Sandell have been piloting the Red Bull Global Rallycross machines and will switch to the new Americas Rallycross Championship (ARX) in 2018. Atkinson is no stranger to Subaru’s rally programs. Between 2005 and 2008, he was the factory driver for Subaru World Rally Team alongside the 2003 WRC champion Petter Solberg. Atkinson has earned 41 WRC stage wins and 6 WRC podiums including podiums at the famous Monte Carlo Rally and Rally Mexico. He should give Higgins serious competition like Pastrana did last year. Fans can check out the new 2018 Subaru WRX STI Rally cars at Portland Raceway this Friday.